a fragmant of the Easter Celebrations in the U.K. The sun slants across the surface of the lake in the grounds of St. Martha's Senior School promising fine weather for this Good Friday. Above the whispering of the gentle breeze, a pigeon can be heard cooing in the trees. The statue of Mary eternally gazes out over this idyllic scene, lost in sad prayer. About forty of us gather for a re-enactment of Christ's torturous walk to his death, as we prepare to observe the Stations of the Cross. Around the lake are the fourteen crosses, familiar to Christians, symbols of the various incidents that are said to have taken place as Christ made his way to his death on that fateful day so long ago. 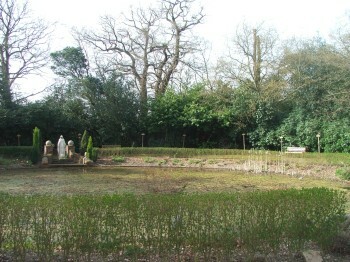 The service at St. Martha's was instigated in our parish by Father Bernard Boylan when he was Curate here in Barnet, for it was he who first saw the spiritual potential of the setting, developed the script and outlined the process of the service which is still largely unchanged. 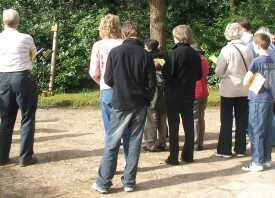 The narrow path between the lake and the undergrowth means that participants have to personally walk the way of the cross. They cannot simply watch a token altar server and member of the congregation walking around them on their behalf. The readings are shared between those attending. A different person at each station. 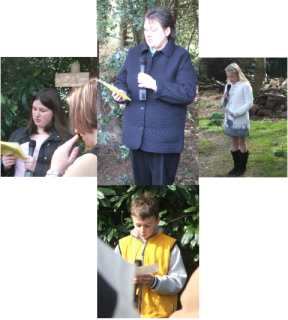 This service is often thought of as being for Young People, and it is true that many of the readers are drawn from the younger age group, but not exclusively so, and there is a wide age range amongst those taking part, from Primary School to Pensioners Club. For the very young an alternative 'Stations' service is held at our Church. Musicians who play in the folk idiom help us sing a verse or two from a variety of hymns and songs, chosen for their relevance at each station. The service is not rushed. Plenty of time is allowed for prayer and reflection. The solemn nature of the service contrasts with the signs of spring evident all around. It seems to me that Christ died to bring us all new life and so perhaps in this contrast we see the completed Easter Message. Of course, it is not always so pleasant. There have been years when the rain has served to underline the bitter and serious aspect of the events we are recalling, as we process round in wet coats, with the musicians trying to keep their music dry. But what ever the weather, the tranquillity of this open air setting always seems to engender a reflective mood as we contemplate Christ's final earthly journey. Later on Good Friday we will attend the more formal celebration of Christ's Passion and the Veneration of the Cross, the second of the Easter Triduum, where Christ's life, death and resurrection, and our own salvation is proclaimed and remembered. But to my mind, it is always the Stations of the Cross that brings home the sacrifice that Christ made for me.